One of the biggest advantage of Nokia N8 over the iPhone 4 is the price. With the price tag of €370 euros before taxes and subsidies, and converting it to pounds would give us £300. Comparing to the iPhone 4 (unlocked) 16GB with a price of £499 and £599 for 32GB. Therefore making the Nokia N8 much cheaper for a smartphone with cool multimedia features and especially Symbian^3 os. We admit that the iPhone 4 is slimmer, but there are consequences on this, like on the camera performance e.g. zooming and sensor size. For the color variants of Nokia N8, the mass is already have a wide choice for their taste on the color. There are currently 5 anodized casing for N8 the dark grey, silver white, green, blue and orange For the iPhone 4, there are two the white and the black (no pun intended) and obviously I don’t like that my phone is mistakenly identified by others as an iPhone 3GS or iPod touch. The limitations of Apple facetime for the Wi-Fi connection and iPhone to iPhone is what Nokia already solved and made possible long time ago to their devices. So in N8 you will not be bounded by connections and you will get connected for the video calls in any capable devices. Another one few specs that a 2010 smartphone have is the HDMI connection where you can connect to your home theatre. With HD TV you will get a crisp and clear visual treatment as well as with your sound with the Dolby Digital Plus. The Nokia N8 has a 16GB internal storage plus giving you a chance to add an external hot swappable microSD card up to 32GB. If 48GB of storage is not enough for you then consider this USB on-the-go feature where you can read and make slave USB sticks from external hard drive like on this 250GB hdd. If you’re afraid to get a bad reception just because of the phone’s inability to not allow you to have a proper grip, well, isn’t that obvious that this could be one of the biggest mistake that Cupertino company made? Eventhough Nokia N8 isn’t launched yet, we all know that this Finnish giant have more than 1 billion of devices out there and we never have the incidents where people protests just because of the reception issue. To have the biggest camera sensor in the field of camera phones—and even bigger than the other p&s cameras—means that we are having the right innovations. By the size of the N8 and to its one of a kind features, it really shows that this is an advance feature that Nokia N8 will hold against competitors. It is still a strong advert of manufacturers that LED flash can provide you enough light for taking pictures. But it is still a fact that xenon flash are the one who leads in the technology of flash for compact cameras as well as to mobile phones. What Nokia did is they reduced the size of the flash to 30% less compare to Nokia N82 & without losing the power. If you’re phone has an HD capable video recording and Symbian^3 on N8 has an on-board video editor and without pulling some extra bucks from your pocket, of course. The same on Ovi Maps, neither we need a connection nor we would pay for it. That is really the magic of Nokia, bringing us connected anywhere and anytime. Obviously, we are not biased on posting articles nor we are against iPhone 4 to prove if just check Norman’s article about reasons why he shouldn’t wait for Nokia N8. Nice confrontation. The N8 is already a winner, specs-wise. Now we need to see it in all markets Nokia is active for the real impact. I am not a fan of Apple. However, Apple iPhone 4 has one major advantage over the N* that needs to be pointed out. It is available now and no one knows when the heck we will see the N8! By announcing the phone with no release date, and as each passes without a release date, the masses are opting for the iPhone 4 now instead of waiting. To be fair thought you did leave out a major advantage the N8 has over the iP4. It can be used on multiple 3G networks. The iP4 can currently be used only on AT&T. We all know that. But the N8 will be able to access 3G networks on both AT&T and T-Mobile in the U.S. Have AT&T & don’t like their data rates? Switch to T-Mobile without switching devices (assuming you aren’t under contract of course). Very nice! Thanks for that addition. I actually run out numbers just to point the top ten. In the US that is much of a concern but later this year lots will be going to have an unlocked iPhone 4, most likely US will get next year based on rumors. The release date for the N8 is supposed to be August 24th-25th. The iPhone 4 also has pentaband 3G, but instead of working on T-Mobile, it will work on DoCoMo (1700MHz vs. 800MHz). I imagine it’s probably Apple’s attempt to break into the Japanese smartphone market. You missed a massive one (for me a least), built-in FM transmitter! It was confirmed yesterday, the 29th, that the iPhone 4 will be available with Verizon in January. However, don’t bet on it being unlocked. None of the U.S. carriers sell phones with plans and all phones are configured to their specifications. One can purchase unlocked phones for use to avoid 2 yr contracts, but the few unlocked iPhones out there are expensive and/or have been hacked (voids the warranty). I personally have all unlocked Nokia devices and currently use the N900 on T-Mobile. I have no contract and can switch carriers at will and hope to never have a locked device. That said, I look forward to the N8 and will try it on T-Mobile. However, their coverage pales to that of AT&T so I may go back. What keeps me with T-mobile is their unlimited data plan….no longer an option with many U.S. carriers. Ooops… I type too fast. None of the U.S. carries sell phones without plans is what I should’ve said in my first paragraph. There were phones with better hardware than iPhone 3GS and there will be phones in the future that will have better specs than iPhone 4, but one thing that they will lack are the variety of apps. I have 5530 and sick of not finding apps and not being able to download a lot of nice games and apps because my device is not supported. E.g., there is no decent internet radio app that plays all stations, and the one from nokia labs has awful interface (you need to edit text files to add new stations) and it doesn’t support quite a few streams too. My n97 had an awesome internet radio app, free sports tracker, well ness diary, swype, all the games you could ever want. 5530 aint exactly iphone comparison, one cost 3 times the other. The applications on the phone is what makes (or breaks) the popularity. Hardware can be changed overnite, but to build a solid application base it takes ages. Nokia was there before Apple, but still lacks behind in terms of popularity in Apps. You can see this in their market segment (Smartphones). Well, farewell to that blog. They have made a great effort on keeping the blogosphere alive. But symbianworld is still here tho. All the display and reception problems with the iPhone 4 should be enough for anyone to choose the N8, even without going into the hardware specifications and software ui. Ovi Share is free. You can send your pictures to cloud, delete them from your phone and take more pictures. It is not necessary to buy a memory card. And yes, free offline navigation is something i can’t live without any more. ovi is moving out of nokia. Nokia should promote it wisely. They should take advantage of their free services. after using iphone for a while, and back to nokia, i felt that nokia is a toy. like the child has. If Nokia phones had a more consistent UI and minimum hardware standards (min. RAM, CPU speed, GPU acceleration), maybe more developers would take advantage of this market opportunity. Aples one size fits all approach has made things much more simple and holistic. Nokia needs to start managing its software and device portfolio as ONE Team instead of a compilation of pet engineering projects all competing for limited resources. Let’s give Anssi a little more time. I hope Nokia would not miss this opportunity and if they will, then it’s a hell critical for them. Long live to NOKIA,i have a n95 8gb,and i can say that i’m really satisfact with him,the only cellphone that i change for is the nokia n8! Nokia N8 is better device. It has 12 MP camera on Carl Zeiss optics and Xenon flash. It also support multitouch. The price is also lower compare to iPhone 4 which only offers few multimedia features. Nokia N8 has an USB on-the-go, hdmi, divx playback and more. 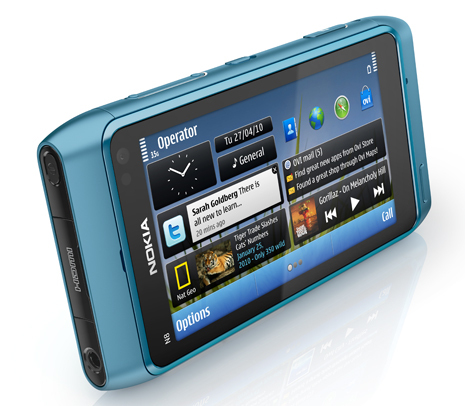 Nokia n8 is simply amazing with its features hope it does well in the market looking forward for it. I think this is important issue not widely known so far. iPhone 4′ WiFi interface seem to be extremely sensitive to ambient 2.4Ghz traffic. I have just tried playing the Apprentice from BBC iplayer. Experiences differ my iPhone4 is complete hiccup, while when I use my N8 playback goes seamlessly. Speedtest.net gives a clue on the nature of the problem with iPhone4 – it does mere 750 mbps download – not enough for a standard definition clip. Indeed, at 7am when people sleep iPhone does as well as N8 and benchmarks show 16mbps performance. Pardon Steve, What are you saying? Oh, I need to adjust my sleeping habits to WiFi traffic… indeed. The phne is way to overpriced as the hardWare and ui belong to th midrange department…. 1. Screen Rersolution cant be counted, as, with theyr equal display size, you cant see any difference from normal distance. 2. As to current announcements, a S^4 will never come to existence, but S^3 will be cept p to date, future points towards meego. i have N8 myself, its not slow and dosnt lagg, unless you have about 20 apps open, which as far as i know you basically cant anywhere else. CPU and ram only should be compared if two devices were running the same OS. Nokia has been manufacturing phones for more than 30 years. They make phones that work. The iPhone can’t even work as a proper phone. Fix that first Steve. network reception is very poor my sister owns an iphone an i have a NOKIA N8…i am always connected bt at times she is not !!!! N8 is a Camera and a GPS Navigation device built into a phone. Instead of carrying 3 devices, you only carry one. iPhone also has camera and maps but you need wifi! iPhone camera cannot match N8. How to navigate when you don’t have wifi?? why the screen resolutions and Processing speed are not discussed?? Iphone4 is best of all in them. nokia n8 has 12mp camera n iphone has 5mp…..
if iphone comes with 12mp then no company could provide bettr resolution than iphone wid 12mp camera…. There is nothing in iphone except the touch calibration. Its the best, but nothing else in it. Coming to apps that Apple provides is way behind what Nokia ovi store has… Nokia is emerging with new things. But Apple is coping them from Nokia and Black Berry. If you can observe Apple is always 6 months late in launching its products.. The iphone cannot even work properly as a phone. Fix that first. There are lots of sites out there comparing photos and videos taken with iphone and N8. Most are done by apple fannies trying their best to make their iphone look better. anyone with half a brain would know that the iphone with 5 mega pixels is no match for N8 with 12 mega pixels and the biggest sensor. Nokia also uses carl zeis lens and xenon flash to make it as good as a regular camera. iphone is only better on screen resolution. This is good if you are happy with staring at your iphone screen all day long. Nokia allows you to output your photos and videos through HDMI to your TV screen. Can iphone do this? @12563e673c219112abdaa2f63ef772d2:disqus yes iphone can do this, you have to buy the adapter, and those who hate iphone are just trying to convince themselves that there is some device which can beat it, use it once and next moment you come to know what it is. Wake up guys. you need the best camera? buy iphone 5 on september. what nokia lacks is a decent application store . who really needs 12mp really 5mp is more than enough people . you get all exited for sepcs you really don’t need . think about it do you really need 12mp , are you all wedding photographers or what !!! , how much are you going to enlarge your picture ?????. now with an iphone i can do endless things with a picture it’s like having photoshop with me . don’t get me wrong i despise apple’s way of limiting the iphone’s capabilities so there is nothing better than a JAILBROKEN iphone . for those of you critisising the iphone please do some research before doing so , have you ever heard of sygic gps and for those of you bragging about 48gb of memory do you really need it . i have 32gb and currently using 10.2gb and i have 141 apps installed plus 1230 photos and 82 songs so please think clearly . now if nokia’s ovi store gets much better i will definitly switch to nokia’s n8 . but for now in my opinion apple has the upper hand . previous owner of ipod touch 1g and proud owner of iphone 3gs. I am with you on the medical apps, i hate that nokia doesnt have the espn3 app either. Still dont want a phone that REQUIRES a case. I like to go naked with my phones. Always have, Always will. The nokias have lasted me 2 years atleast without cases. First the E71 and then the N97 and now hope fully the N9 (soon). No keys, just swipe the phone (just picture wiz saying that) Un huh you know what it is. My friend has an HTC the screen broke with the cover on, good thing she has warranty, got a new phone, week later screen broke on the second one with the cover a week later. All those Iphone screen repair websites must be there for a reason. You dont see a nokia fix your screen website. forgot one thing no one does touch screens like apple period. if you were an iphone owner you will all understand what i’m saying . and another thing who can resist free apps on a jailbroken iphone . i have saved 530$ worth of apps . lexi-complete alone would have cost me ~250$. nokia n8 is certainly a better phone, and why arent people crazy over the usb on go feature,that is very very cool…Although still the camera doesn excite much, coz to be frank nobodys out there clicking professional photographs a 5mp works just fine..
And might i point out to every one who is targeting the app market of nokia..it might not be as big as apple or android but i have always found the apps for nokia which are way cool,avi players torrent clients etc..outside the ovi ofcourse..! Despite all the pros of the N8, Apple’s biggest trump card is its refined, polished, ultra easy-to-use user interface. Symbian’s biggest flaw since the days of the 5800 has been that. A below par UI (something which is crucial to a touchscreen phone). Even the new Symbian OS, despite all it’s functionality and features is still clumsy to use and doesn’t even come close to iOS, BADA or Android. Got a N8 last week… touch screen is a big upgrade from 5230 and 5800.
lost it ova nokia !!!!! WAS A BIG FAN EARLIER !